When you stay at Expedition Station in Snowshoe, you'll be near ski runs, within a 10-minute walk of Snowshoe Mountain and Split Rock Pools. This ski condo is 10.3 mi (16.5 km) from Cass Scenic Railroad and 3.9 mi (6.3 km) from Shavers Lake. Make yourself at home in one of the 90 air-conditioned rooms featuring kitchenettes with refrigerators and stovetops. Complimentary wired Internet access is available to keep you connected. Conveniences include separate sitting areas and microwaves. Enjoy the convenience of ski-in/ski-out access at this condo, which also features a fitness center. Additional amenities at this condo include complimentary wireless Internet access, ski storage, and tour/ticket assistance. Have fun with onsite winter activities, including downhill skiing, snowboarding, and snow tubing. Conveniences like ski storage, skiing lessons, and ski equipment rentals allow you to spend less time with logistics and more time on the slopes. At the end of the day, order après-ski drinks at the condo's bar. Public areas are equipped with complimentary wired and wireless Internet access. Expedition Station is a smoke-free property. 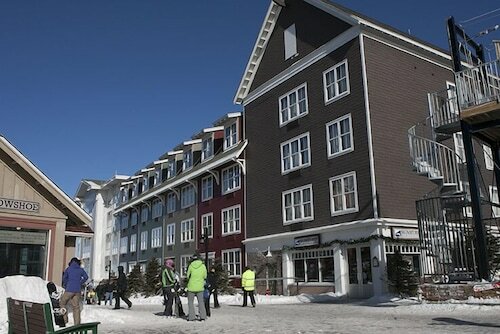 Recreational amenities at the condo include ski-in/ski-out access and a fitness center. Please note: Check-in for this property is located off site, at Mountaintop Check-in, located in South Mountain, or the Inn at Snowshoe, located at Base Mountain.